From the celebrated author of Who I Was Supposed to Be, Susan Perabo's collection of twelve "ingenious and lovable stories that] crack open the world" (Kirkus Reviews, starred review) and illuminate the everyday truths of people facing challenging situations...often of their own making. 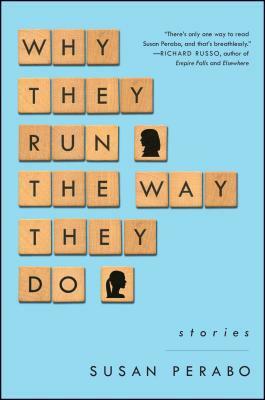 In Why They Run the Way They Do, critically acclaimed author Susan Perabo illustrates the triumphs and tragedies of daily life. Perfectly distilled into moments of sharp humor and poignancy, this collection features ordinary people in sometimes extraordinary circumstances. Two young students try their hand at blackmail upon learning an illicit secret; a woman grapples with feelings of betrayal after discovering her spinster sister's pregnancy test; the ghost of a couple's past comes back to haunt them in the form of their toddler's stuffed toy. Weaving the banal and bizarre together, "Perabo's clear, wry sentences meld a prose style that's reminiscent of Raymond Carver's with a sensibility that's informed by People" (The New York Times). Here, this "literary talent" (The Boston Globe) captures the human condition through struggles that are quiet and grand; dark and provocative. Brilliantly crafted, Why They Run the Way They Do is ultimately an homage to the philosophy that life without humor is no life at all.